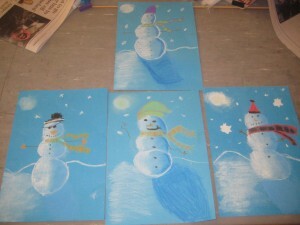 We have been busy in both rooms today, completing lots of lovely Christmas art. 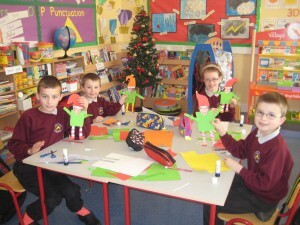 Check out some of the amazing elves that the junior room have made. 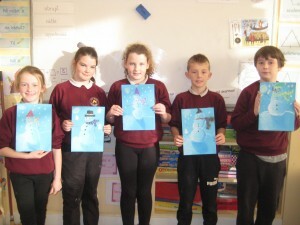 The senior room have also made beautiful snowman pictures using chalk pastels. We are really getting into the Christmas spirit and can’t wait for next week for lots more fun Christmas activities, including a trip to the cinema! Christmas came early in the junior room this week with the arrival of lots of new toys. We were so excited when we came to school on Monday morning and saw a new Village Shop, a new dress up area full of cool costumes and also a new sand and water box. 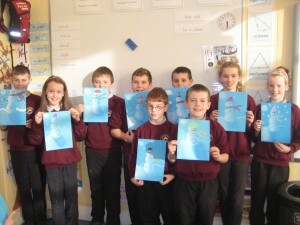 We have had great fun using them during Gaeilge and drama lessons this week. We’ve also been secretly hoping it would rain at break times so we could stay inside and play with them! 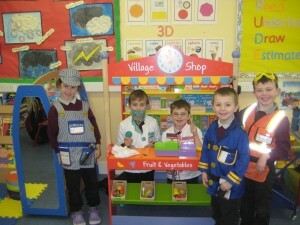 Have a look at us all dressed up in some of the new costumes.